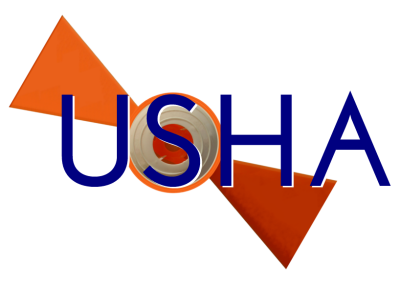 The mission of the USHA is to promote the growth of Helice, an exciting form of artificial target shooting which is rapidly becoming more and more popular, especially in Europe and the USA. shotgun sport. 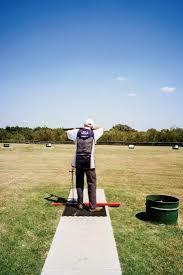 12 bore shot-guns are the largest gauge permitted to be used. the wings simulate the erratic, unpredictable flight of a live bird. calls "Ready" and the machine operator must reply "Ready". and lands within a fenced area (ring). Target flight times are short and unpredictable, compounding the difficulty, so speed and accuracy are at a premium. The helice ring, illustrated at left, is where the actual shooting takes place. 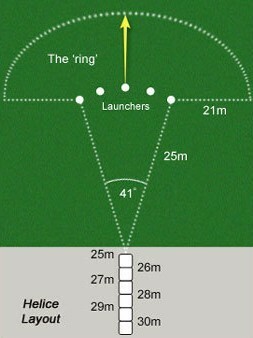 The ring shown is a typical 5-box (five machine) layout, which is the standard, most commonly-used layout for USHA competitions. Click the thumbnail image to view the layout full size. 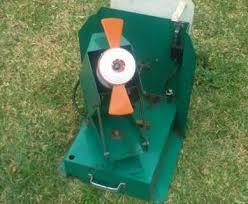 shooting should be North or North East with the axis going through the Shooting Stand and the Middle machine. 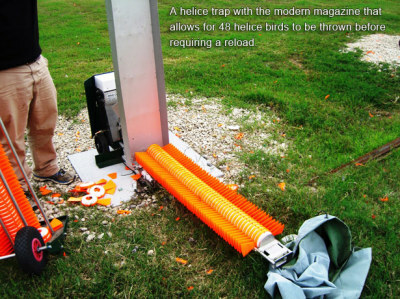 Helice rings typically include either five or seven box launchers, which are arranged in a semi-circle in front of the shooter's position. For five-machine layouts, the machines are positioned between 4.50 meters and 5 meters apart.